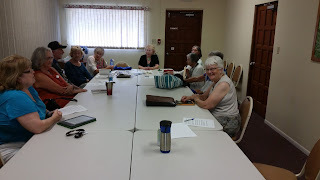 Members of Mary Mother of Jesus Inclusive Catholic Community in Sarasota, Florida spent almost one hour and one-half in a lively discussion of Chapter 5 "love and suffering" in her ground-breaking book on evolutionary spirituality in The Unbearable Wholeness of Being by Sister Illia Delio. One of our conclusions is that this book presents a deep mystical theology that most Catholics, in the view, of most of our group are not aware of even now. God in institutional religion has been portrayed as a judging, avenging God. Some of the women in our group said they were told to stay in marriages that were abusive and offer it up. This book liberates God and the human spirit for an encounter with boundless love. "...love is not what God does, love is who God. Faith is what brings us into the deepest truth that says we are in the image of a unlimited , unrestricted, unimaginable love." p. 84. "God is not the prime mover of a static cosmos but the dynamism of love swelling up in space time through the process of evolution and rise of consciousness. " Song of Praise: Glory to God, glory. O praise him, alleluia. Readings: Two excerpts from Portrait of a Woman. Profession of Faith. I believe in God, the creator of heaven and earth. I believe in Jesus Christ, child of God, born of Mary, human like us. to live in the fullness of grace. Jesus called for God’s people to focus on the kin-dom within. Jesus was crucified and buried in a borrowed tomb. living in our hearts and present in our world. the people of God gathered in worship and song. God experiencing life everlasting. Amen. Voice 2. May we continue to build a church where all are equal. brought to you by Mary Mother of Jesus. All: Amen Collection and Procession of Gifts to the table. You are whole. I am holy (x3) I am whole. We are holy (x3) We are whole. and fill them with the fullness of Jesus We remember Jesus . and gave it to them saying, “Take this, all of you, and eat. In the same way, Jesus took the cup of wine. “Take this all of you and drink. This is the cup of my lifeblood. Voice 3. Remember, gracious God, your Church throughout the world. Make us open to receive all believers. We join with all God’s people, with Bridget Mary our Bishop, and with Francis our Pope. Voice 4. In union with all people, may we strive to create a world where suffering is diminished, where justice and peace are restored, and where all people can live in health and wholeness. Presider: This is Jesus who liberates, heals and transforms us and our world. All are invited to partake of this banquet of love. Voice 5: For the thanksgiving, give thanks this way: First, for the cup: We thank you, Abba God, for the sacred vine of David your son, whose meaning you made clear to us through our brother Jesus, yours ever be the splendor. Voice 6: And for the bread fragment: We thank you, Abba God, for the life and wisdom whose meaning you made clear to us through Jesus, yours ever be the splendor. Voice 7: As this fragment was scattered high on hills, but by gathering was united into one, so let your people from earth’s ends be united into your single reign, for yours are splendor and might through Jesus Christ down the ages. We sing the final blessing: You are the face of God, I hold you in my heart, You are a part of me, You are the face of God. You are the face of God, I hold you in my heart, You are my family, You are the face of God. Presider: Go in the peace of Christ, may our service continue! Alleluia! All: Let it be so! Alleluia! Closing song: Always Remember, v5&6, refrain; v7,refrainExcerpts from Portrait of a Woman, Herbert O’Driscoll. Toronto: Anglican Book Centre, 1981.
with Mary the mother of Jesus, and with his brothers. Lake fishing for a living did not encourage the gentler virtues. there seemed to be no end to it. by the immense affection shown to her. together, any small gathering of his followers. hoping to stay with various families. by those whose friendship had meant so much to her son. John and a few others had stayed here. he was hesitating before turning to her. this simple but terrible action. the kind of friendship she had longed for so desperately. But now she saw them differently. the rough bread melding with her body and the wine stinging its way into the center of her being. This too is the word of God. All: Thanks be to God. our history we have remembered her in innumerable ways. explain yet equally impossible to deny. lives to be a channel for the grace of her son. 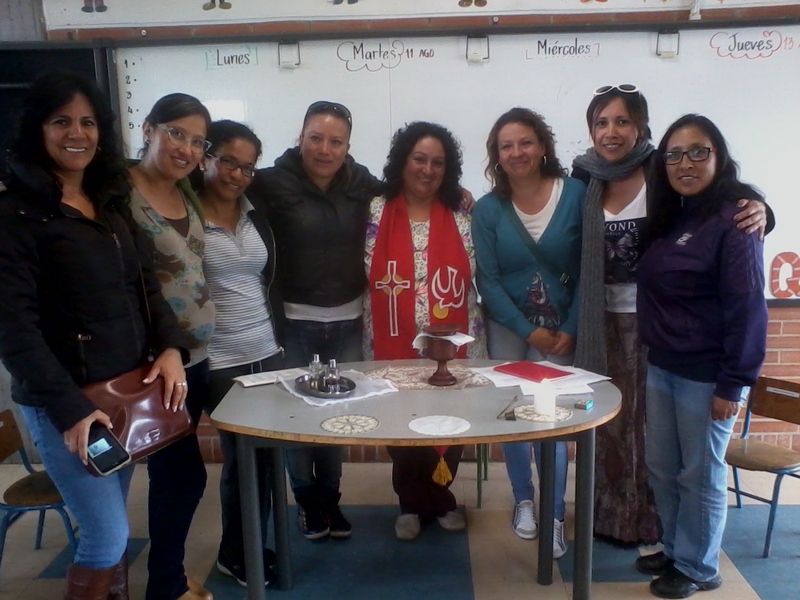 Rev Aida Soto, ARCWP, at the invitation of her colleagues of the College, Celebrated the Feast of the Assumption and the impending arrival of the baby of one of the companions of the College. 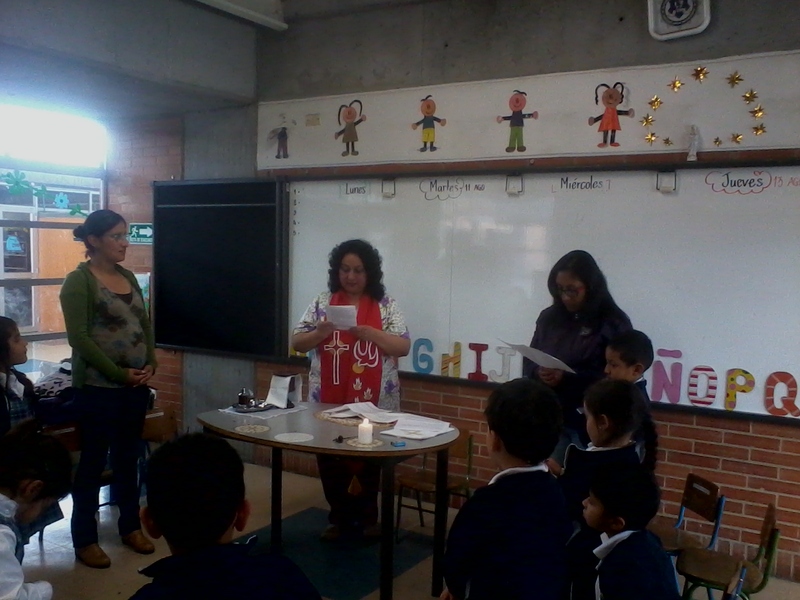 The Liturgy was Conducted in one of the classrooms. The celebration of the Virgin Mary's pregnancy and her mission as mother of Jesus. A photo report of the celebration in Colombia. 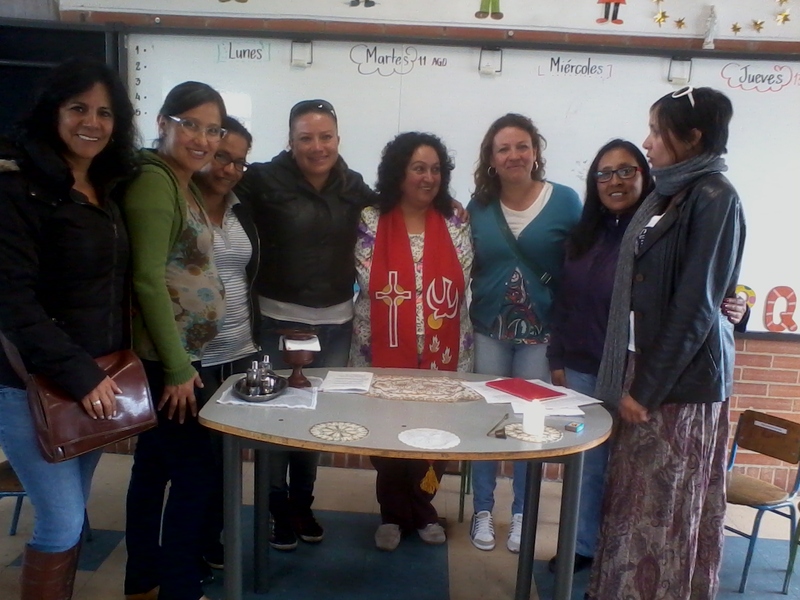 Teachers, children and the Rev. 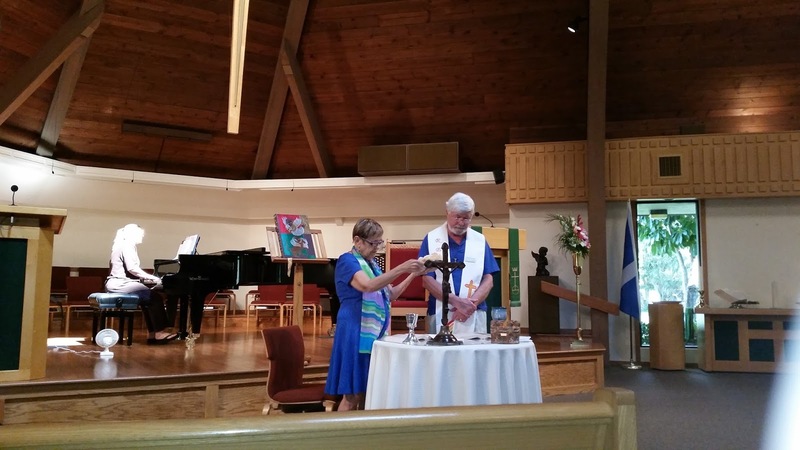 Aida celebrating the Eucharist. The Magisterium united Thanking the Divinity! Greeting: Welcome to each of you as we gather this morning to celebrate with joy the life of a good man and to release his body to be cremated. Those of us left behind acknowledge the pain of loss and separation and it is difficult. May you be comforted knowing that we are all part of God’s great creation and as such we, like all that exists, began as stardust. We believe that we are spiritual beings cradled in our human bodies that must return to the earth. Christians believe that in death life does not end but that we fall into the embrace of our loving God who raised Jesus from the dead, and will raise us into a new life in glory. So too with Ford, yet we also believe that his spirit soars and he still walks with us. Just as the body returns to its origin so too does Ford’s spirit returns home to his Loving God. Opening Prayer: Let us pray, Gracious and Loving God, we gather to remember your son, Ford. We remember the many ways that Ford revealed you to us. We remember the generosity of his loving and through his love we felt your generous Spirit. We remember the ways that Ford nurtured, encouraged, affirmed and supported us, and through him we felt your nurturing Spirit. We remember Ford’s extraordinary human spirit and his direct connection to you. We have come to know you, Generous Spirit, through your son, Ford. And for this we give you thanks. Amen. We believe we exist in God, but in a God beyond our images and descriptions. God beyond the many names we use: Breath of Life, Creator, Source, and Sustainer of everything that exists. Everywhere we look, this energizing presence comes to visible expression. We believe that each of us gives this presence and source a unique way of doing so. Everywhere we look, we can observe the perpetual rhythm of new life, followed by death, followed by new life. So we do not believe that death is the final end of anything, nor is it for us the start of a journey to somewhere else. Rather, it is a transformation in the continuation of the ebb and flow of existence in ways we do not understand. Ford’s death speaks to us of the wonder of being human in the universe so vast and so magnificent and of our existence within a mystery and a power that we cannot put into words. In a very real sense, this vast and magnificent universe of ours came alive and became aware in Ford. He gave God a way of coming to expression, here in our lives, here in a way that reached out and touched us, as a husband, a father, a grandfather, a brother, and a loyal friend. He lived and loved God. God lived in him and loved in him. And in death, Ford lives on in God and in us. In a start billions years ago? That finally brought human form to those atoms? When I did whatever you loved about me. In ways beyond words and images. as this Spirit continues to move in your lives. In the Spirit of Life and Love. Dear friends. Since God so loved us, we also ought to love one another. No one has ever seen God, but if we love one another, God lives in us and God’s love is made complete in us. God is love. Whoever lives in love lives in God, and God in them. This is how love is mad complete among us. You bring me to green pastures for rest. Let us pray the Prayer of Jesus: Our Father and Mother…….. Gentle Spirit, as we release Ford’s body for cremation, we give thanks for his human body who laughed and cried, loved and saw the wonder of creation in family, children and grandchildren. We give thanks for the many ways Ford’s life touched ours. We give thanks for the generosity of his loving and his faithfulness. We give thanks for his dedication to and healing through AA….and for Charlie. We give thanks for the courage through great suffering and how he faced death. We give thanks for Charlene’s love and faithfulness that anchored him as he faced struggles and medical challenges. We give thanks for his supportive family and for children and little ones who gave him delight and purpose. We especially give thanks for Ford’s extraordinary human spirit. Ford is now at peace with you, his Loving God, and Ford remains with us and in our hearts always. Amen. Ford, go with and live on in peace with your God. To each of us here, go now in peace, knowing that Ford forever remains part of our lives and lives on in our beings. Amen. The feast day of the Assumption of Mary will be celebrated in the church this Saturday and the gospel reading that we just heard will be used. Have you spent much time thinking about the ex cathedra teaching about the assumption of Mary that was given by Pope Pius XII in 1950? Maybe that has not topped your list of things to ponder but it is a good place to start as we think about our theme tonight of primacy of conscience. This infallible teaching of the 1950s has some flaws as it was based on the common theology when original sin was predominant. The premise of this ex cathedra teaching says that our bodies undergo the corruption of death due to original sin that all people are born with except Mary because her body was assumed into heaven. One hundred years before the teaching about Mary’s assumption another infallible teaching was proclaimed that said Mary was conceived without sin. The teaching of original sin lead to elaborate theologizing in order to keep Mary untainted and well preserved. I don’t think Mary would approve especially if you look at the way she is pictured in the gospel of Luke. I just can’t see this Mary in need of being proclaimed as one who was born without sin or as one who was assumed. Can you? Wasn’t it good enough that she bravely answered God’s call to be the mother of Jesus? Fast forward from the time of Mary and Elizabeth to 1953, just a few years after this infallible teaching about Mary was given. The world was a place with rigid ideas about what was right and wrong or what was sinful or pure. The following scenario played out in the world in many ways and can give evidence to the need for us to follow our informed conscience even when the world around us beckons us to do otherwise. What does this girl do? Just what she is told…she gets in her car alone and drives by herself to the doctor’s office. She tells him her mother sent her there. He gives her directions to the home of a woman who will “help her with her problem.” She returns to her car and drives to the woman’s home. The woman invites her in and performs an abortion. After driving home home, the young woman goes into the bathroom, begins to hemorrhage and then passes out. She wakes up in the hospital. “You almost died,” the doctor told her. “I wish I had,” she responds. The nineteen-year old woman went against her own conscience. She moved against the law on her heart that was inscribed by God. In doing so, she sentenced herself to a prison of deep pain and self-judgment that affected each of her relationships in a negative way throughout the rest of her life. Her story is similar to the many people who have served in the military and suffer from PTSD. All through history many have been unable to stand up to sinful structures, systems and abusive authority figures despite the voice of God in their conscience. We honor and remember those who did. In a Sunday Angelus address in 2013 Pope Francis reiterated Vatican II teachings about the importance of primacy of conscience, resurrecting what his predecessors suppressed. “May Mary help us,” he said, “to become more and more…free in our conscience, because it is in conscience that the dialogue with God is given-men and women able to hear the voice of God and follow it with decision. 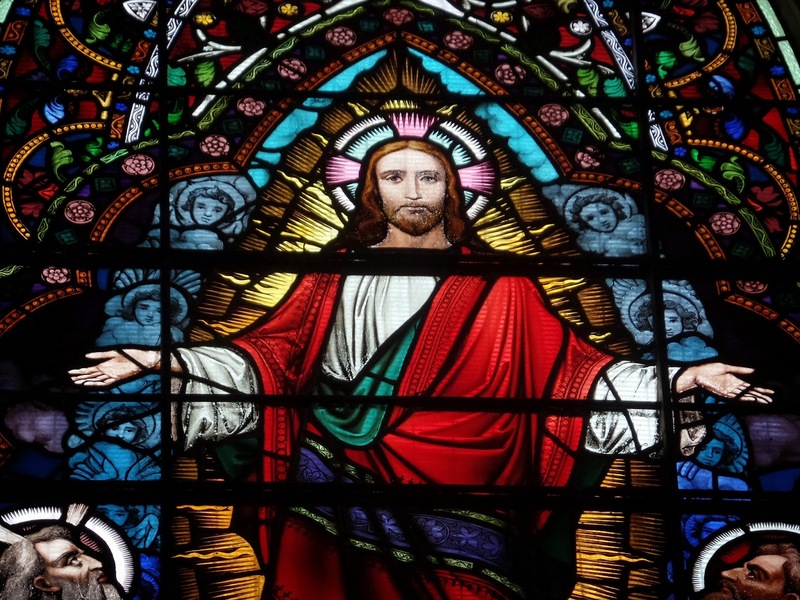 Jesus wants neither selfish Christians, who follow their egos and do not speak with God, nor weak Christians, without will, ‘remote-controlled’ Christians, incapable of creativity, who seek ever to connect with the will of another, and are not free. Jesus wants us to be free, and this freedom-where is it found? 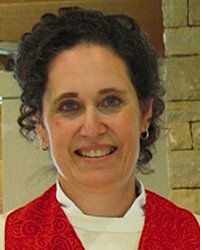 It is to be found in the inner dialogue with God in conscience.” Will Pope Francis put actions to his words and lift the excommunication of women who have followed their consciences and were ordained as priests? 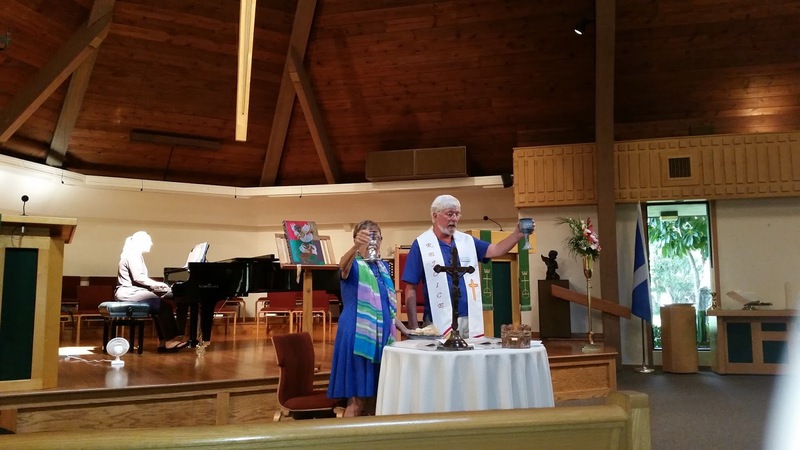 How about the people like you who worship in these liturgies? Wouldn’t it be fitting for the Pope to lift threats of excommunication and loss of diocesan jobs? We must admit that many solid teachings of the past have been proven wrong. We now know that the world is not flat, that the earth revolves around the sun and we come from original blessings not sin. We are always learning new things about our world and ourselves. The more we learn about ourselves the better we know God. With knowledge comes responsibility. We know how to send a person to the moon and how to genetically create an animal. We live in the information age and in a world of rapid change. Just because we can do something should we? My first reaction was, ‘no way, too much pressure’. The weight of the request gave me pause. Who am I that I should attempt something like this? The words “carried high, processed, danced” all cried out in bold and I pondered whether I was worthy to say ‘yes’ to this request. 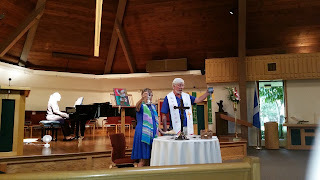 After a few days of thinking about it I came to the conclusion that if I didn’t accept I would be missing a tremendous artistic opportunity and challenge..."
another piece of the “bread of life” discourse. but is a story about how Jesus' followers felt about him. it means that the followers have to accept the whole person. they have to swallow the whole thing. and we are free to choose which invitation to accept. Today's first reading is Wisdom's invitation. picking a piece of Wisdom and a piece of Folly. but that's not a fitting metaphor for what we're doing. of an informed conscience on a moral issue. I prefer to see us as “grocery store” Catholics. We're already in the store. at the time we're living it. depending on what's in it and where it came from. like copper sulphate, salicylic acid, borax, and formaldehyde. food dyes, high fructose corn syrup, and refined sugar. that grazed on pasture planted where a rainforest used to be. We routinely hear of salmonella breakouts from contaminated food. to read the labels when we go to the store. The same thing is happening in our Church. where the rules came from, and why. We want to know who made it, and when, and what is was for. or if they were trafficked kids sold into slavery. What are we eating these days? we learn how to read the labels. he pointed to Wisdom's choice, not Folly's. What is our institutional Church feeding us? Pope Francis has been making improvements. that makes the moral choice clear. because we have swallowed it whole and found it bad. to massacre and enslave and oppress. and set them loose to prey on even more children. to try to be something other than what God made them to be. and to reject the harmful and hateful rules. where it has strayed from the way that Jesus taught. that we are to be filled with the Spirit. an age full of love of God and neighbor. We become what we eat. as we share in the breaking of the bread. Presider: Let us pray as we come together to break the bread in the namess of God, our Creator – and of Jesus, our Liberator - and of the Holy Spirit, our Sanctifier. All: Amen. All: God of life, truth and compassion, you who directs all creation to its ultimate fulfillment in Jesus, the Christ - open our hearts to the message of the Gospel so that your peace may rule in our hearts and your justice guide our lives. Loving God, bless the hearts of all of us gathered here now and all of those of our community who are not with us today. We ask this in your name and those of our Savior Jesus, and our Wisdom Sophia. Amen. Presider: Loving God, we do not fully open our hearts to your Spirit within us. All: Help us to open ourselves to Her message and be your voice among your people. Presider: Christ Jesus, we do not really trust enough in your promise that you would send your Spirit. All: Help us to grow in our understanding and confidence that your word brings peace. Presider: Holy Spirit, pour out your healing grace and supporting strength on us. All: Help us to respond to your presence in us and bring that blessing to your family. All: (with an outstretched arm): God, the Father and Mother of mercy, through Jesus’ life, death and resurrection, he bonded the world to you. He sent the Holy Spirit among us to give us the wisdom to love you and the strength to love one another. Loving God, teach us the virtues of pardon and peace so that we may – in turn – learn to forgive each other our failures to care for one another and for our planet Earth. We ask this in the name of Jesus, our brother and of the Holy Spirit, our comforter. Amen. All: Glory to God in the highest, and peace to God’s people on earth. Heavenly God, Creator of the universe, we thank you for the wonder of the Spirit at work in everything that exists, everywhere in the cosmos. Through Jesus Christ, you opened our minds so we could realize that you are always among us and that we are able to experience you among our brothers and sisters. We ask you to receive our prayers, for you are the Most High, with Jesus Christ and the Holy Spirit. Amen. First reading: 1 Kings19: 4 - 8 All: Thanks be to God. 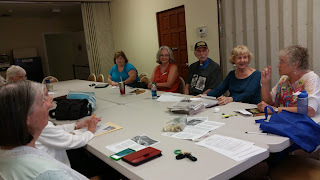 Second reading: Paul’s letter to the Ephesians 4:30 – 5:2 All: Thanks be to God. Gospel: John 6: 41 - 51 All: Glory and thanks to our Savior, Jesus the Christ. Discussion starter: How many times have we told ourselves “enough” and how many times have we been told (in effect) “get up and eat”? In those situations when we may feel like Elijah in the desert, how do we understand Jesus’ claim to be more than the passing manna but, rather, is the very bread of life that restores and supports us? Short version: how do we understand Jesus as the bread of life, our life? All: We believe in God, the Creator of the universe whose divinity infuses all existence, making everything everywhere sacred. We believe in Jesus, the Christ, who leads us to the fullness of humanity. Through him, we become new people, called beyond the consequences of our brokenness. We believe in the Holy Spirit, the Sustainer, who keeps the Christ-vision present to all those who are searching for meaning and wholeness in their lives – and the One who energizes us when our Spirits may grow weary in our journey. We say: Amen to courage, to hope, to the Spirit of truth. Amen to wholeness, to the partnership and equality of all people of different gender, race, and faith. We believe in a world of justice and peace for everyone, everywhere, with no exceptions. In all of this, we surely believe. Presider: We are a community of faith in our Creator and compassion for our sisters and brothers. Then, mindful of God’s love and care for us, we now bring our concerns and needs to our God. All: After each intercession, respond: Loving God, hear our prayers. Presider: Healing God, we know that you faithfully listen to our prayers. We ask you to strengthen us in our caring for one another and in our works for justice, equality, and peace. the grain from the earth and work of human hands. It will become for us the bread of life. the fruit of the vine and work of human hands. It will become for us our Spiritual drink. Presider: In this bread and wine, Jesus has promised to be present; through our sharing of them, Christ will make us whole. 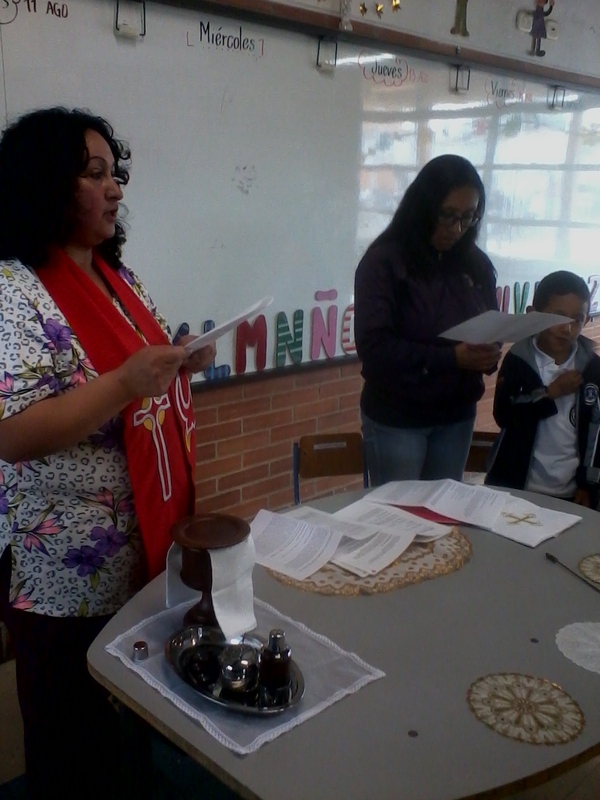 ALL: Gracious God, we are united in this sacrament by the love of Jesus Christ in communion with all those who proclaim your power and mercy to the marginalized and oppressed peoples. Like Mary, the first disciple, and all the saints through the centuries, may we live as prophetic witnesses to the Gospel. We ask this through Jesus, the Christ, Amen. Presider: God dwells in each one of us. All: Namaste!. Presider: Sacred Spirit, we recognize your presence with us as we gather at our family table. All (sung): Holy, Holy, Holy God, God of power, God of light. Heaven and earth are full of your glory. Hosanna in the highest. Blessed are all who come in the name of our God. Hosanna in the highest… Hosanna in the highest. Voice 2: We thank you for the gift of Jesus in history and the gift of Jesus in faith. Through him, you breathe life into us. He revealed you to us in his life well lived. He showed us, through his example, not only how we should live, but also for what we may even die. Voice 3: And when his time had come, Jesus suffered for what he deeply believed…his conviction that love is stronger than death...and then, as an example for the ages, he opened wide his arms and died. The Spirit, who raised Jesus from the dead, is the foretaste and promise of the paschal feast of heaven. All: O God, let your Spirit come upon these simple gifts that we have brought from the fields to our table -- this wheat, gathered and grown and this wine, fruit of the land. May She make them holy, so that they may become for us the Body and Blood of Jesus, our brother. In the same way, he took a cup of wine, said the blessing, and gave it to his friends saying: take this, all of you, and drink it. This wine is you; this wine is me. We are one blood, the presence of God in the world. Do this in memory of me. Voice 4: In memory of Jesus’ life, death and resurrection, we offer you, God, this life-giving bread, this saving cup. We thank you that we are in your presence and serve you. May all who share this sacred meal be brought together in unity by the Holy Spirit. And may that Spirit, that Wisdom, move freely in our lives as well as She did in that of Jesus. Voice 5: God, remember your church throughout the world, help us grow in love, together with Francis, our Pope, Bridget Mary, our Bishop, and all your family everywhere - especially those who live on the margins of church and society. Remember also all those people, living and dead, who touched our lives and left their footprints on our hearts. We remember especially…. (mention names, if you like). 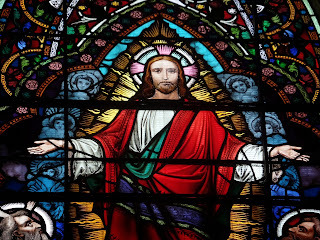 All: Our Father and Mother, who are in heaven, blessed is your name…..
Presider: Jesus, you said to your disciples, “My peace I leave you; my peace I give you.” Look on the faith of those gathered here today and …. All: Grant us your peace. By the example of Jesus and with the strength of your Spirit, help us to spread that peace throughout the world, to everyone, everywhere, no exceptions. Amen. All: Loving God, you call us to speak truth to power, have mercy on us. Loving God, you call us to Spirit-filled service and to live the Gospel of peace and justice, have mercy on us. Loving God, you call us to be your presence in the world and to be bearers of compassion everywhere in your name. Grant us peace. Presider: Eternal God, may this Eucharist in which we always share Christ’s healing love deepen our oneness with you and unity with one another. We ask this in the name of Jesus, the Christ, and the Spirit, the Wisdom. All: Amen. May we learn to bless and honor and hold in reverence the Earth and each other. Amen. All: (with an outstretched arm): May our nurturing God bless us gathered here and all those in our communities – in the name of the Creator, in the name of Jesus the Christ, and in the name of the Spirit, our Wisdom, as we minister to one another as the people of God. Amen.